Malcolm at Midnight by W.H. Beck. Review: Do you like to read books about animals talking to each other? Do you like to read about action, adventure, and mystery? Well then Malcolm at Midnight is the book for you! 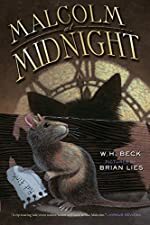 Malcolm at Midnight by W.H Beck is a book about a mouse, well, technically a rat but everyone thinks he's a mouse because he is so small! The rat's name is Malcolm. So when Malcolm is bought from a pet store by a teacher, he is taken to another world he has never seen, a school. Then on his first night there he meets the Midnight Academy, a secret alliance of pets that keeps the school in control (secretly). Well, at least that's what they think they are doing. This is a good book and I really liked it. . My favorite part of the book is when these two hamsters, Jesse and Billy, take Malcolm around the school to look for food. Then Malcolm accidently gets into an elevator that takes him to the fourth floor. From there he goes into a storage room where he meets an evil cat, Snip, that chases him until his friend Aggy, an iguana, is at the bottom of the stairs when Malcolm is pinned by Snip. Then Aggy starts making a weird sound, like a hiss. Snip gets a little frightened by the sound bounds back up the stairs. Malcolm leaps down the stairs and then Aggy takes him back to his room where he goes into his cage and lays down on his Com-Fe-Cube, and drifts off into a sleep. I liked Malcolm at Midnight because it had a good mystery and some action. It also had suspense, like when you wonder what's going to happen next. I also liked the setting of the book. It was at a school, which was pretty interesting. So I'd recommend this book maybe at a grade level from 4th grade to 6th grade. I give this book a 4 out of 5. We would like to thank Houghton Mifflin Harcourt for providing a copy of Malcolm at Midnight for this review. Have you read Malcolm at Midnight? How would you rate it?